We’ve got anti-homeless benches outside of our office. They’re very uncomfortable and as a result no one uses them opting to sit on the front steps of the building instead. This drives management up the wall as they think it unsightly but it’s their damn fault. Idiotic design in my opinion. I’ve noticed this lighting in some of the less salubrious pubs and clubs in Leicester. Doesn’t really work though, since drug users have learned to use a magic marker to mark their veins befoe going into the toilet. Of course it’s to move the drug users elsewhere. 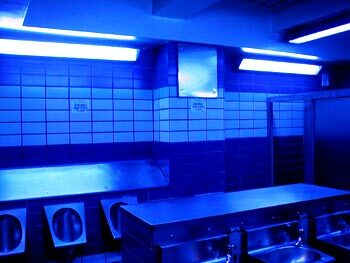 The establishment using the blue lights doesn’t have an interest in protecting drug users from themselves; their interest is in protecting the other customers of the establishment from having to encounter drug users shooting up in the washroom (by giving the drug users an incentive to use some other place’s washrooms). I don’t see it so much here in bars as I do in places that have free entry and unattended washrooms, like laundromats and pizza-by-the-slice joints. I don’t buy the idea that there’s a bystander effect like there is with the poor-visibility intersections, though. 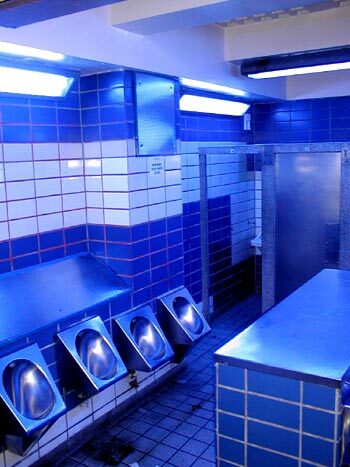 All things being equal, washrooms without drug users are safer and more comfortable for their intended use, and if drug users decide to use the washroom to shoot up anyhow, the blue light doesn’t make it more dangerous for the intended use than a washroom with regular lights. Thanks for the comments, everyone. I think Rich is probably right that the bystander effect is different to that with the poor-visibility intersections, most of the time at least. My wording wasn’t great! I suppose what I meant was that if drug users still choose to inject under blue light and make mistakes, or need multiple tries, the effect on bystanders may be worse than if they did it more easily under normal light. There may be more discarded needles, blood, or worse. But yes, overall, it would seem that the aim is to move the problem on. Not the effect you mention specifically, but retailers are certainly aware of the effects lighting can have on their sales, and increasingly there is the research to prove it. I have to hand a guidebook by a lighting manufacturer Zumtobel Staff titled ‘Lighting for the Workplace’ that points to research from, among others, Brown University that reports that the brain has a non-visual light receptor most sensitive to blue light. Exposure to blue light apparently causes the production of melatonin in the pineal gland to be suppressed, making us more alert, since melatonin makes us sleepy. In this context, they are attempting to convince us that expensive light fittings containing blue light in the workplace make for more productive employees, but annecdotally it’s no secret that alert shoppers spend more. You can experiment with this effect yourself if, like me, you work or spend time in a building with little daylight. Though there are many factors that cause that afternoon lull, you will probably find this lull is less severe if you take an outdoor lunch break for at least 20 minutes. I cannot see why you have a problem with this? I think its in excellent idea! Its in my local train station(Reading) and if it keeps people from shooting up in the toilets, its a good idea! This would be a fairly rich heroine addict who would waste alot of money pumping drugs into his arm, when most likely they would just go elsewhere! The way I see it, the blue light hardly effects me, and if it lessons the risk of me bumping into a freshly high addict while going to the toilet, I cannot see the problem. Yes, this is only moving the problem on, but at least its slightly protecting the public from a potential danger(including needles left on the floor). you know i am not a heroin user. i live with one, i know what it is like to go thru the malia’s or sickness. um, i have been addicted for a long time since i was about 18 now 40 and have seen my mom all my life on opioids so i do know what it feels to be addicted. i am addicted to coke and pills, and it feels as though no one understands. i feel so alone. and i agree i think if the DOH would give addicts what there addicted to it would not only help the addict but society would benefit in alot of ways i know this is not societys problem but yet it is. if the addicts would just be looked at as people not bad people they are just looking for help not judgement. oh i was going to make a statement on this blue lite, if your a addict you do not care where you are you can be in a park in a library in a parking lot sitting on the ground if you need a fix your going to fix, outside inside wherever. being a addict is a disease not easy to fix even with a blue lite…. nice looking though. Blue lighting doesn’t work. They have just abandoned it in Pearse railway station in the heart of Dublin. The druggies simply traced the required vein with a pen before entering the toilet. You have to admire the simplicity of that solution though there might be an increased risk of infection depending on the care taken with the pen and its contents. I notice that the image heading this piece also shows the sloping surface deterent. I know of a gallery in Brighton that could only get planning permission for an additional toilet provided that all surfaces sloped at 45 degrees – to prevent cocaine use (it was an art gallery)- as it was a disabled toilet it was also a requirement that it had baby changing facilities – a horizontal fold-out platform, perfect for setting up a chemistry set. The horizontal plinth in the photo above is presumably part of the same folly. The addicts just mark their veins with a black felt tip before going into the toilets anyway. Simple.